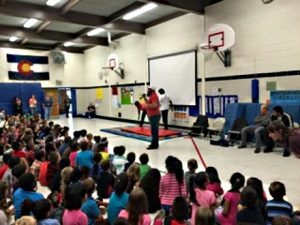 Yesterday, eight of the country’s finest Greco Roman wrestlers visited Will Rogers Elementary School in Colorado Springs, Colorado to give a presentation to the students. 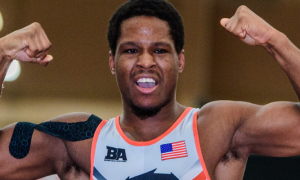 US National Team Head Coach Matt Lindland enlisted an impressive group of athletes for the cause: Olympian Robby Smith, RaVaughn Perkins, G’Angelo Hancock, Cheney Haight, Patrick Martinez, Corey Hope, Joe Lyle, and Bo Beckman. The discussion centered around leadership and respect, which are topics that were quite familiar to the wrestlers involved. A “Q & A” session was also part of the proceedings. Students asked the group questions about a slew of subjects and even got to see Martinez nail an arm-throw. 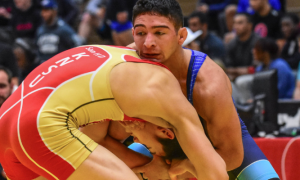 For many of the kids it was not only an opportunity to check out what high-level wrestlers are like in the flesh, but they also got to learn that events like this are taken very seriously by the athletes, who see themselves as more than just along for the ride. If Smith is of the attitude that what the athletes say makes a difference, Hancock is in lock-step with him. The question is, does the rising star see himself becoming a role model right before our very eyes? Needless to say, it was quite an experience for all involved. 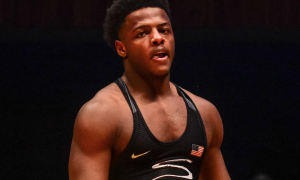 The US Greco Team is always quick to reach out to the community but when things like this break right, it imparts as much of an impact on the athletes as it does those they meet with. Undoubtedly there is more to come.